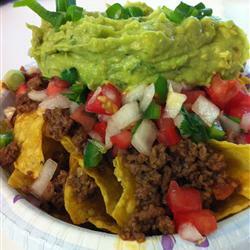 Growing up my son Mike’s specialty was nacho’s he always threw together the best nacho’s ever. When it hit the table we just dove in like a fumble recovery. So I present my version of his Nachos for NEpatriotslife.com game day recipe. I do him no justice. Did you know Howard Cosell made a huge impact on nachos acceptance to the mainstream! Do you know who Howard is? Cook and stir ground beef or whatever- if chicken or turkey add a little olive oil to brown,in a skillet over medium heat until meat is crumbly and no longer pink, 5 to 10 minutes. Drain excess grease. Stir in taco seasoning mix and water and simmer until beef mixture has thickened, 8 to 10 minutes. Set the oven rack about 6 inches from the heat source and preheat the broiler. Line a baking sheet with aluminum foil. Spread tortilla chips on the prepared baking sheet; top with Cheddar cheese and dot with refried beans and ground beef mixture. Broil in the preheated oven until cheese is melted, watching carefully to prevent burning, 3 to 5 minutes. Howard Cosell: Nachos ultimate champion!! Now here is where the story gets even better. The tasty snack becomes a specialty in many restaurants in Southern Texas but is virtually unknown anywhere else on the planet. That is until a gentleman by the name of Frank Liberto decided to try to sell the stuff as a concession stand item! He changed up the recipe by reformulating the cheese to be soft all the time and using simple tortilla chips. He began to sell his new version of nachos in 1977 in Arlington Stadium in Arlington Texas. but what really made the concept take off was a visit by “Monday Night Football” later that year. Before the game started they were offering the product in the reception area where Howard Cosell took a liking to the name. That night and for weeks after, Cosell and the rest of the “Monday Night Football” team worked the word nacho and the product itself in wherever they could! From there on out nachos quickly grew into the massive force they are today!! This entry was posted in Beef, Dessert, Appetizer and Snacks, Information, Meat, Patriots Game Day and tagged black beans, Cheddar cheese, Howard Cosell, Nachos, olives, salsa, sour cream. Bookmark the permalink.